Freedom and Flourishing: How much does over-work affect happiness? 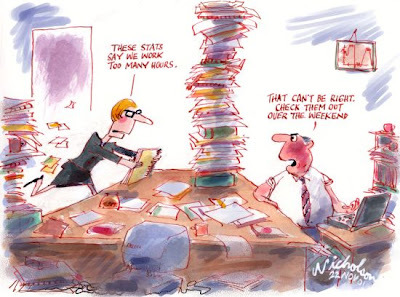 The results of a survey conducted recently by the Australia Institute apparently shows that half of Australians (61 per cent of those working overtime) were prevented from spending enough time with family in the preceding week as a result of over-work. According to the press release (which is the most detailed description of the study I could find) a lot of people don’t have time to exercise, eat healthy meals or go to the doctor when they should. If we take the results of this survey at face value it would appear that over-work is a huge problem in Australia. I suspect, however, that the problem or over-work is not as widespread as the Australia Institute suggests. I also suspect that over-work has a much smaller adverse impact on happiness than does under-work. The results of a study by Bruce Headey, Ruud Muffels and Gert Wagner, based on a long-running German panel survey, shows working hours to be one of the factors that has a long-term impact on life satisfaction. One of the things I like about the study is that the variable used is a measure of the extent to which respondents achieve their preferred tradeoff between work and leisure, rather than divergence of working hours from some arbitrary standard chosen by researchers. The relevant variable was the gap between the number of hours a week respondents said they would prefer to work and the number of hours per week they actually work. Those who worked over 3 hours per week more than they preferred were treated as overworked and those who worked over 3 hours per week less than they preferred were treated as underworked (‘Long running German panel survey shows that personal and economic choices, not just genes matter for happiness’ PNAS, 2010). The results indicate that the negative impact of under-work on life satisfaction was about four times greater than the negative impact of over-work. The authors suggest that this ‘is presumably because lost consumption rankles worse than lost leisure’. (It would seem that the regression analysis does not control for income levels.) The study suggests that the negative effect of unemployment is much worse than that of either over-work or under-work (about four times greater than for underwork). Some of the other results of the study might help further to put these findings into perspective. The study shows that social participation – a measure of frequency of meetings with and helping out friends, relatives and neighbours – has a substantial positive effect on life satisfaction of around the same magnitude as the negative effect of under-work. The positive effect on life satisfaction of frequent exercise is of about the same magnitude as the negative effect of over-work. The adverse effect of having a neurotic personality is about ten times greater than that of being overworked, but having a neurotic partner has only about half the adverse effect of being overworked. What should we make of these findings? One obvious qualification is that it isn’t clear to what extent they might apply outside Germany. Leaving that aside, it seems to me that the most important implication is the importance to individual happiness of having the opportunity to work as many hours as the individuals concerned want to work. Under-work is not as bad as unemployment, but it is likely to be a much worse problem for the individuals concerned than is over-work. It is hard to see how anyone could argue that overwork could be a huge problem when people are free to choose among jobs on the basis of hours of work along with other employment conditions. Some individuals may make bad choices, allowing themselves too little time for social participation and exercise, but that is not a systemic problem. The Australia Institute report has now been published. It has some features that I like e.g. over-work and under-work are judged relative to respondent's desired hours of work. However, I think the findings on percentages prevented from spending enough time with family tend to overstate the extent of the problem. The percentages who always feel rushed or pressured for time are relatively low. It seems that having children living in the household is as great a source of time pressure as working overtime (Figure 4). Finally, the study doesn't tell us much about the emotional well-being of those who work more or less than their preferred number of hours. This seems to me to be an area where data on life satisfaction can be useful. I have posted more information on this subject, including subjective well-being data for Australia, in a more recent post entitled: Is work-life balance a big problem in Australia? I know a lot of people that do a fair bit of overtime. These people all have a goal to achieve, and are very happy people. It's true you do lose touch with friends when working like this, but depending on the people you know these things can be worked around. For instance, there are friends that we invite over only on a Tuesday night, it's one of the nights that C does not work, so we have a barbecue or something similar. Even though my Hubby doesn't work overtime as such, we also have a problem with keeping in touch with friends. My Hubby is a shift worker, where he works, it's a 24hr rotation. So really it's not only the people that work overtime, but shift workers as well go through basically the same thing. I think a lot depends on the people that you know, whether everyone can work together to still see each other and catch up, we find e-mails are great in this situation. Friends don't often ring us, as they never know if Hubby is asleep or what shift he is on, but through e-mails, they will usually find out this information, and then follow up. Hi Mags. I think the situation you describe of happy people making compromises to achieve their goals is normal. It would be nice to know how the Australia Institute managed to get the result that 61 percent of people working overtime were prevented from spending "enough" time with family. Perhaps the Australia Institute just asked respondents if they would have liked to spend more time with their family in the preceding week. It would be hard for any working person to say 'no' to that question - but the information is just as meaningless as asking people if they would like to have more money.